He watches her from the shadows. With the people of the tri-worlds converging for the first Interworld Games, Shard plans to watch from the sidelines as he protects Glacium’s royal family. But when the woman he has pursued for over a year urges him to enter the games, he must drop everything or risk losing it all. Now, Shard’s head and heart are competing for first place. Uncertainty digs at the cracks in his battle-hardened armor. Duty and friendship struggle under mounting pressure. The cool and calm manner he prides himself on is about to explode. . . .
. . . And he has no idea what will happen when it does. 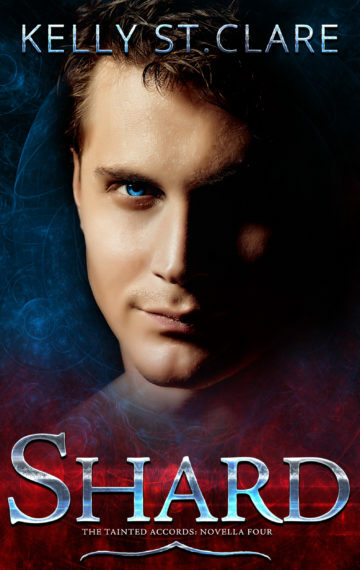 PLEASE NOTE: Shard is part of a companion novella series and is designed to be read after books 1-4 in The Tainted Accords.